Rules To Refinance. 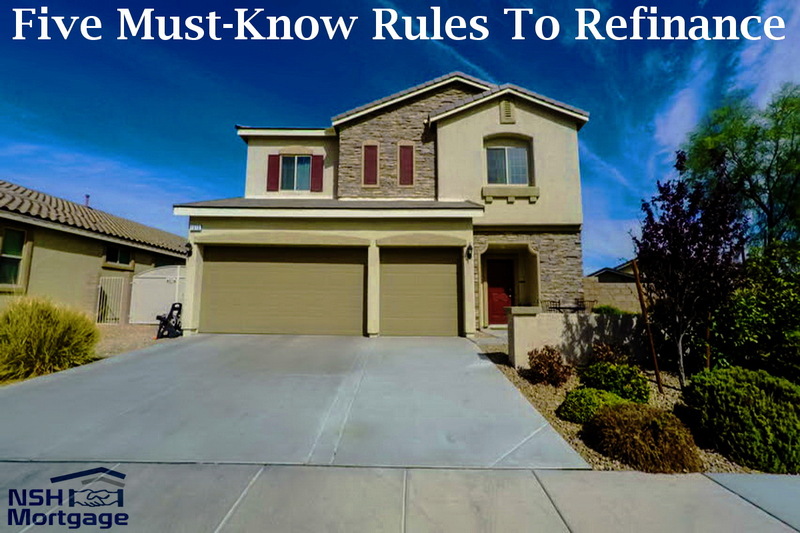 NSH Mortgage has the knowledge and tools to help you with understanding the five most important rules about refinancing. When does refinancing make sense? Many views the answer to this question only in terms of mortgage rates. The usual idea is that when rates go lower, it is time to refinance. However, the availability of lower mortgage rates should not automatically trigger a refinance application. In addition, there are other opportunities which also suggest that a new mortgage might be appropriate. In basic terms, there are five situations when refinancing should be considered. If your goal is to free up cash for other things, or if your current mortgage is difficult to afford, you might want to refinance for a lower mortgage payment. You can achieve this by choosing a refinance with a lower interest rate, a longer term, or both. In fact, you can reduce your payment by refinancing the remaining balance of your loan over a new term at the same rate, because you are extending your repayment period. Extending the total time it takes to repay your mortgage may get you a lower payment, but it may also increase your total costs over the life of the loan. That is not necessarily bad, but you should be aware of it. Unless your current payment is unaffordable, refinancing just to lower your payment is not usually a great idea. It can cost you a lot more in the long run, because you will be extending the total time it takes to become mortgage free. To see if you are really saving money with a refinance, see what your new payment would be if you did not extend your repayment. If your current 30 year loan is five years old, what would your payment be with a 25 year term? Take the difference between that payment and your current payment to see if you are saving money. If it costs you $5,000 to refinance, and the monthly payment difference over 25 years is just $25, it would take 200 months before you break even and start saving money. That is something to keep in mind when determining if refinancing makes sense. If you have an adjustable rate mortgage, and worry that rates might increase, it can make sense to refinance into a fixed rate product. It depends on your loan’s potential rate increases and the number of years you expect to have your mortgage. If your current loan could potentially increase to 5.25 percent next year, and you could get a fixed loan at 4.25 percent today, you should probably investigate a refinance. If you have an older loan product with a balloon payment due in the next few years, refinancing to a 30 year, fixed rate product can help you avoid a monster payment. If you cannot cover the balloon payment, the result could be foreclosure and the loss of your home. In such a dire situation, the real need is to get rid of the balloon payment, even if interest rates are rising. If you have a home equity line of credit (HELOC), it can be prudent to refinance with a 30 year, fixed rate mortgage when the draw period ends. The reason is that HELOCs can require very high monthly costs once they enter the repayment stage. Suppose you have a $100,000 HELOC. During the first five years of the loan’s 15 year term, you withdraw as much as you want, up to your limit. You are only required to pay the interest due each month during this time. However, after five years, you cannot withdraw anymore money, and you must repay the debt. At five percent interest, the required payment is $1,061. That is because you only have the ten years to pay off the balance. If that is too steep, consider a new loan to combine your first mortgage and the HELOC into a 30 year loan. When Does Refinancing Make Sense and When Does It Not? While refinancing can be a very good idea, there are also situations in which borrowers should use caution. So when should you refinance? When it is to your benefit. That means you have to consider how long you expect to remain in the property, how much refinancing will cost, how much you can save each month it is pure and simple, whether your money might be better spent just paying down mortgage debt.